Jam tracks, or backing tracks as they're also known, are a great way to practice guitar. Not only do they make practice more fun they also train you to play in time, hear how your solos sound over a song's chords, and get into the habit of listening to the band you're playing with. These benefits make them a practice tool that I use all the time. But like any tool, a little knowledge of how to use it can help to obtain even more from them. 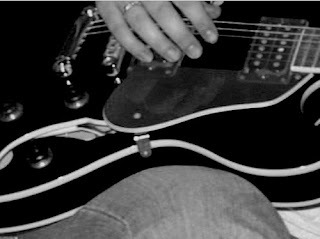 Here are three tips to help you get the most out of your jam tracks as you practice guitar. Without a plan it's easy to lose your way with jam tracks. You can waste time as you repeat the same exercise over and over or doodle aimlessly and forget to work on important skills. Before you start playing set out a plan for your practice session. You don't need anything fancy, but decide in advance what you will work on. How long will you spend? What keys will you play, and at what tempos? Answer all these questions in writing before you start and use your list to keep on track as you practice. To get the most out of each of your jam tracks create copies at different tempos and in different keys. You can easily create copies with changed pitch or tempo with software programs such as Audacity or Riff Master (that's my affiliate link, I'm confident that you'll never regret what this purchase will do for your guitar skills). If a track is too fast for you to work with then you don't have to leave it on the shelf. Simply slow it down. You can create faster copies as you improve until you work up to and beyond the original tempo. While there are a wealth of great quality jam tracks with full backing bands out there I believe it is still important to create your own home made tracks. The big advantage of home made tracks? Simple, the process of making them forces you to work on all of your guitar skills. You'll improve both your rhythm and lead playing and learn how to put together interesting harmonies of several guitar parts. I'm not saying you shouldn't use professionally recorded jam tracks, they are great fun to play with. But you can also have a lot of fun and learn a load when you make your own. Nowadays this is easy to do with either a small multi-track recorder or a computer with some simple multi-track recording software. Jam tracks are often thought of as a tool for playing solos over, end of story. But all areas of your guitar playing can benefit from practice in time and in fitting with the rest of the band, so why miss out? I hope you'll try out some guitar jam tracks as part of your guitar practice. Learn to play in time, hear how your playing sounds over a song's chords, and experience the fun of playing as part of a band  all in the comfort of your own home. Photo by My Sweetheart The Drunk. As usual, you open my mind to new aspects of the guitar playing, even when talking about subjects that I think I already know. Hi Lucas, glad to be of service.